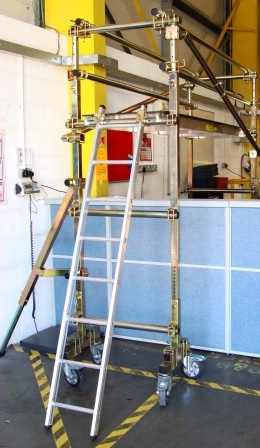 Above desk maintenance is a problem that can readily be solved by using the LOBO System. Office desks cannot easily be moved and desk tops are often populated with monitors and other computer equipment, the photo show a LOBO System with a 1.7m clearance and featrues telescopic handrails as the ceiling height is only 2.6m. The LOBO System can be set at any height above the desk and the computer monitor to span the desktop. This allows access above the desks and into the ceiling areas above. The no tools assembly procedure ensures a quick and safe process. 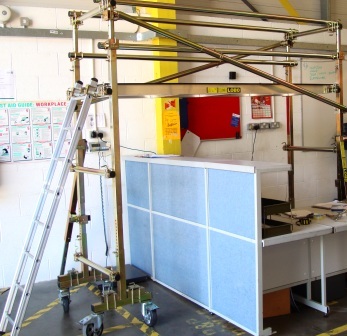 As the LOBO System is modular, access into the suspended ceiling is possible. 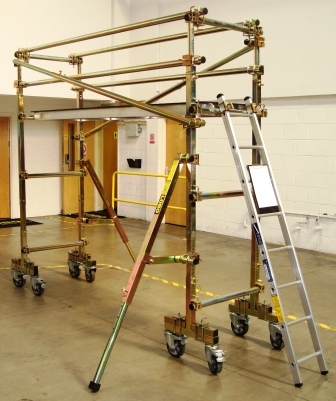 A platform can actually be assembled above the suspended ceiling grid, if required. This configuration uses 2 Outriggers to ensur it is stable and solid, the wheels make it easy to move around the office floor and the unit takes only 20 minutes to put together.